Since the beginning of this century, Goji berries and juice are being sold as health food products in western countries and praised in advertisements and in the media for well-being and as an anti-aging remedy. The popularity of Goji products has rapidly grown over the last years thanks to efficient marketing strategies. Goji is a relatively new name given to Lycium barbarum and L. chinense, two close species with a long tradition of use as medicinal and food plants in East Asia, in particular in China. While only L. barbarum is officinal, the fruit (fructus Lycii) and the root bark (cortex Lycii radicis) of both species are used in the folk medicine. We review here the constituents, pharmacology, safety, and uses of L. barbarum and L. chinense with consideration to the different parts of the plant. Investigations of the fruit have focused on proteoglycans, known as “Lycium barbarum polysaccharides”, which showed antioxidative properties and some interesting pharmacological activities in the context of age related diseases such as atherosclerosis and diabetes. As to the root bark, several compounds have demonstrated a hepatoprotective action as well as inhibitory effects on the rennin/angiotensin system which may support the traditional use for the treatment of hypertension. While there are no signs of toxicity of this plant, two cases of possible interaction with warfarin point to a potential risk of drug interaction. In view of the available pharmacological data and the long tradition of use in the traditional Chinese medicine, L. barbarum and L. chinense certainly deserve further investigation. However, clinical evidences and rigorous procedures for quality control are indispensable before any recommendation of use can be made for Goji products. Since the beginning of the 21th century, wolfberries (Lycium barbarum, Solanaceae) a traditional food and medicine in East Asia have become increasingly popular in Europe and North America. Numerous products are commercialized under the relatively new name Goji on the health food market. Goji products are sold in particular via the Internet and praised for well-being and longevity. Meanwhile Goji is also found in conventional food products such as yoghurts. There are in fact two closely related species, L. barbarum and L. chinense, which both have a long tradition as food and medicinal plants in China and other Asian countries. The berries of both species are a very popular ingredient in Chinese cuisine. They are consumed in soups, as porridge with rice and added to numerous meat and vegetable dishes. The fruits which are harvested from August to October are usually dried, but they may also be consumed fresh, like the young leaves which are a valued vegetable. Goji products sold outside Asia contain, according to the suppliers, exclusively L. barbarum berries. However, distinction of wolfberries from different species and varieties is difficult so that substitution or adulteration in commercial products cannot be excluded. Beside its alimentary use, Goji plays an important role in the Chinese traditional medicine. The medicinal tradition not only uses the berries (fructus Lycii) as a renowned Yin strengthening agent but also the root bark (cortex Lycii radicis) as a cooling agent. Despite the importance of Goji in the traditional Chinese medicine and its new popularity in the Novel Food market, there are no comprehensive reviews on its constituents, pharmacology, safety and uses until now. We published recently a short review focusing on the fruit of L. barbarum and its use in Novel Food products . We have now extended our literature survey to include L. chinense and the other plant parts of both species. In addition to the comprehensive review on the chemistry, pharmacology and safety of the plant, the uses in the traditional Chinese medicine are summarized. Finally, the recent emergence of Goji products on the Novel Food market is addressed and legal issues associated with these products are briefly discussed. Lycium barbarum L. (syn L. halimifolium Miller) (Chinese: Gouqi or Ningxiagouqi) and L. chinense Miller (Gouqi) are two closely related species with congruent uses as food and medicinal plants in East Asia. In addition there are some varieties and related species such as L. barbarum var. aurantiocarpum (Huangguogouqi), L. chinense var. potaninii (Beifanggouqi), L. ruthenicum (Heiguogouki) and L. truncatum (Jieegouki) which can be found on the market as low cost adulterants . Traditional English vernacular names include boxthorn, wolfberry, Chinese wolfberry, or matrimony wine . The plant is known as kuko in Japan and gugija in Korea. Since the beginning of the century, the plant is commonly called Goji, an appellation derived from the Chinese name gouqi. L. barbarum L. is a deciduous shrub one to three meters high while L. chinense is somewhat smaller. The leaves are lanceolate to ovate. The oblong, orange to dark red berries measure up to 2 cm and possess a bitter to sweet taste. The fruits of Lycium species possess a highly similar anatomy and tissue structure. Differentiation based on morphological and histological analyses is very delicate. Confident distinction requires molecular techniques such as RAPD (random amplified polymorphic DNA) analyses , . The original habitat of L. barbarum is not definitively established but is probably to be found in the Mediterranean Basin . Meanwhile, the plant is widely distributed in warm regions of the world, in particular in the Mediterranean area, Southwest and Central Asia. It is also cultivated in North America and Australia as hedge plant . L. chinense is mainly distributed in East Asia and grown in particular in South China, Korea, and Japan . The majority of commercially produced wolfberries come from plantations of L. barbarum in the Ningxia Hui Region in north-central China and the Xinjiang Uyghur Region in western China. In addition, L. barbarum is grown also in sheltered valleys of Mongolia. The traditional Chinese medicine makes use of both the root bark (Digupi) and the fruit (Gouqizi). The utilization of the leaves and the seeds is also mentioned in a few medicinal books . Besides China, Goji is part of the medicinal tradition in other Asian countries including, Vietnam , Korea, and Japan. While only L. barbarum is officinal in the Pharmacopoeia of the People's Republic of China , both species, L. barbarum and L. chinense, have been used for more than 2000 years in the traditional Chinese Medicine with early records tracing back to the Tang Dynasty (1000–1400 AD) . There are some discrepancies in the medical books with regard to the species to be used. Some treaties include both species as a source of the drug, while others recommend either L. chinense or L. barbarum. Indications however are essentially congruent. The berries are eaten raw, drunk as a juice, wine or tea. They can also be processed to tinctures, powders, and tablets. The recommend dosage of dried berries varies between 5 and 12 g , . Goji berries are used in traditional Chinese medicine as a mild Yin tonic, enriching Yin in liver, kidneys and moistening lung Yin. Indications derive from the Yin nourishing effect. They include blurry vision and diminished visual acuity, infertility, abdominal pain, dry cough, fatigue, and headache , , , , . The berries are also praised in the folk medicine to increase longevity  and against prematurely gray hair . Medicinal beverages and dietary soups are available at the interface between food and medicine. The root bark is used as a cooling agent to “clear heat” and lower consumptive fever due to Yin deficiency. It is usually taken as a decoction with a dosage varying between 6 and 15 g. The drug is, in particular, prescribed for night sweating, “steaming bone sensation”  and chronic low-grade fever. A decoction of the root bark is effective for treating cough and recommended against hemoptysis and hematuria . Finally it is indicated for the treatment of diabetes mellitus and hypertension , , , . There have been several investigations of the constituents of wolfberry, and the different organs of the plant have been studied. Investigations on the fruit have been performed mostly with L. barbarum, the officinal species considered to be of higher quality. On the other hand, for reasons which are not fully clear, studies on other organs, in particular the roots and the leaves, have focused on L. chinense. The constituents of wolfberry are presented below. The data have been organized by plant parts. Polysaccharides represent quantitatively the most important group of substances in the fruit of L. barbarum. Quantitative data in the literature diverge considerably, but a yield of 23 % based on the dried fruit which was obtained after optimization of the extraction conditions  can be considered as a reliable value. The polysaccharide fraction, referred to as Lycium barbarum polysaccharides or LBP consists of a complex mixture of highly branched and only partly characterized polysaccharides and proteoglycans. An overview of the fractions which have been purified in homogenous form is presented in [Table 1]. The glycosidic part accounts, in most cases, for about 90–95 % of the mass and consists of arabinose, glucose, galactose, mannose, rhamnose, xylose, and/or galacturonic acid , , , , , , , , , . More recently, the polysaccharides of L. barbarum have been also analyzed by preparative high performance size exclusion chromatography (HPSEC). After protein hydrolysis, two major fractions were obtained with a molecular weight of 79 250 and 24 470 amu, respectively . The monosaccharidic composition of the whole polysaccharidic fraction has been determined by GC after hydrolysis. There are however some discrepancies in the literature, in particular with regard to the presence of fucose and mannose as well as the content of glucose. Thus the composition was found to be Rha, Ara, Xyl, Man, Glc, and Gal (molar ratio of 0.3 : 2.7 : 0.3 : 0.2 : 2.7 : 0.9)  or Rha, Ara, Xyl, Fuc, Glc, Gal (1 : 2.14 : 1.07 : 2.29 : 3.59 : 10.06) , respectively, in two similar recent studies. Table 1 Homogenous polysaccharidic constituents purified from the fruit of L. barbarum and L. chinense. A second major group of metabolites are the carotenoids, the content of which increases during the ripening process . Zeaxanthin dipalmitate (1) is the predominant constituent  ([Fig. 1]) representing 56 % of the total carotenoids in the fruit . 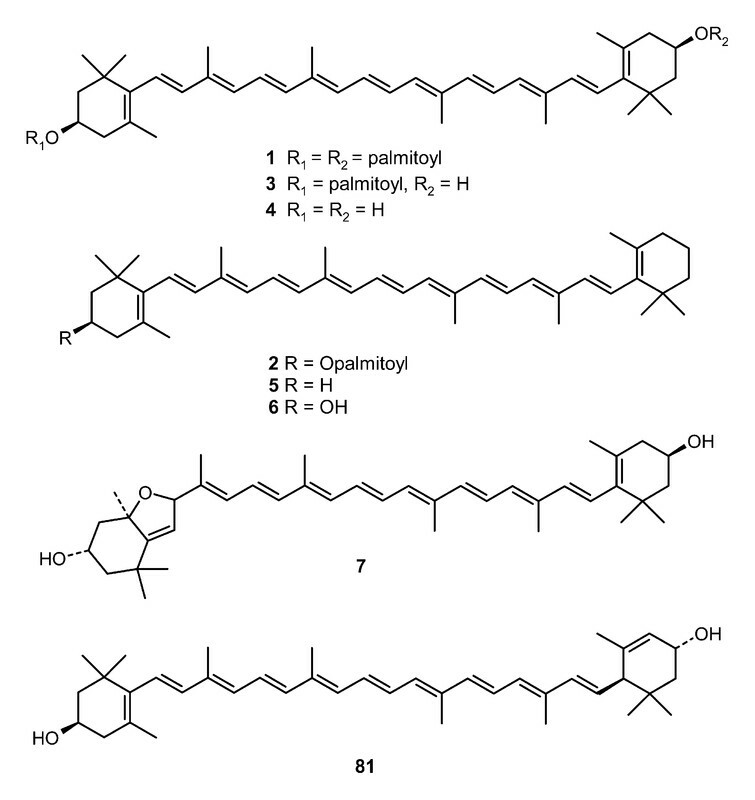 β-Cryptoxanthin palmitate (2), zeaxanthin monopalmitate (3), small amount of free zeaxanthin (4) and β-carotene (5) are also present . As to the seeds, they contain zeaxanthin (83 %), β-cryptoxanthin (6) (7 %), β-carotene (0.9 %), mutatoxanthin (7) (1.4 %), as well as some minor carotenoids which have not been definitively identified . The fruits further contain vitamins, in particular riboflavin, thiamin and ascorbic acid, together with a glucosylated precursor (8) of the latter ,  ([Fig. 2]). The content of vitamin C of 42 mg/100 g is comparable to that of fresh lemon fruits. Flavonoids are another important class of compounds. The aglycones myricetin, quercetin, and kaempferol have been identified after hydrolysis . The essential oil and fatty acids of L. barbarum have been analyzed by GC‐MS, and hexadecanoic acid, linoleic acid, β-elemene, myristic acid and ethylhexadecanoate have been identified as the main constituents . 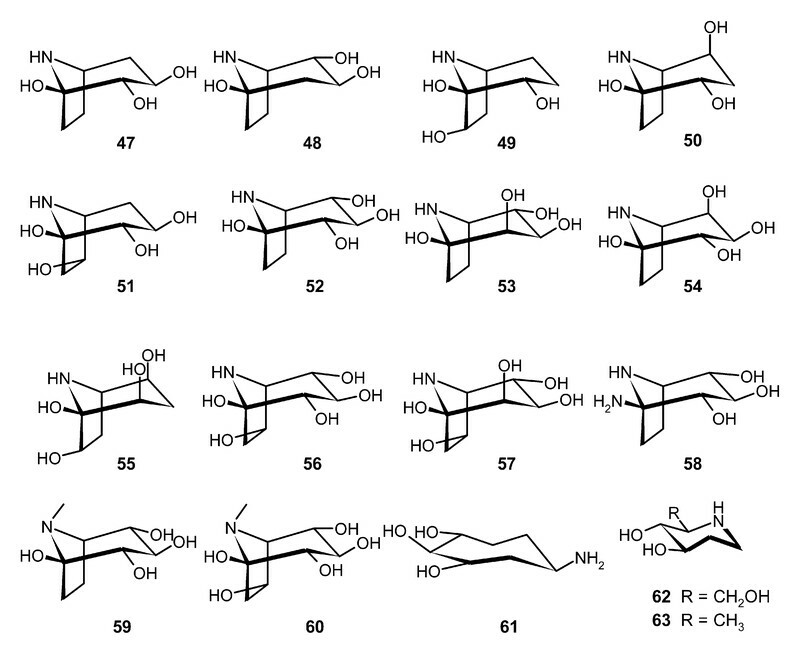 Among the nonpolar constituents, a series of glycerogalactolipids (9–23) have been recently isolated  ([Fig. 2]). The fruit further contains 1–2.7 % free amino acids with proline as the major constituent. The non-proteinogenic amino acids taurine and γ-aminobutyric acid, as well as betaine (trimethylglycine) are also contained in the fruit , . 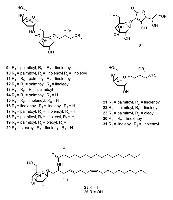 Finally, some miscellaneous compounds have been isolated including β-sitosterol and its glucoside daucosterol, scopoletin, p-coumaric acid , the dopamine derivative lyciumide A (24) ([Fig. 3]) , and L-monomenthyl succinate . Fig. 1 Carotenoids from the fruits and the leaves. Fig. 2 Vitamin C precursor and glycolipids from the fruits. Fig. 3 Amides and miscellaneous compounds from the fruits and the roots. There have been some controversies about the atropine content of the fruits. In 1989, a content of 0.95 % of atropine was reported for a fruit sample collected in India . This finding appears highly doubtful and is in obvious contradiction with the widespread consumption of the fruits and lacking reports of apparent toxicity. In this context, a systematic investigation of Goji berries from various provenances which has been recently performed with HPLC‐MS  revealed only traces of atropine, maximally 19 ppb (w/w), in the analyzed samples. The composition of the fruit of L. chinense appears similar. As in L. barbarum, polysaccharides, carotenoids and flavonoids are the typical metabolites. With regard to the polysaccharidic fraction, an arabinoxylan (Cp-1-A), two arabinans (Cp-1-B and Hp-0-A) and a series arabinogalactan proteoglycans were purified ([Table 1]) , , . Rutin is the main flavonoid and is accompanied by small amounts of hyperoside, quercetin, and morin . The carotenoid composition is similar to that found in L. barbarum. Zeaxanthin dipalmitate (1) is here also the dominant constituent making 49 % of the carotenoid fraction . The fruit further contains zeaxanthin (4)  and β-carotene (5) . In addition, two cerebrosides (25, 26) ([Fig. 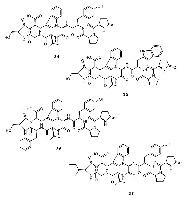 2])  and three pyrrole derivatives (27–29)  with hepatoprotective properties have been isolated ([Fig. 3]). The identification of tocopherols, phenolic acids including gallic, caffeic, and protocatechuic acids, chlorogenic and neochlorogenic acids has been reported . The sterols contained in the seeds have been analyzed as part of investigations on the sterols contained in the seeds of various Solanaceae plants: cycloartenol, cycloartanol, and 24-methylenecycloartanol , gramisterol and citrostadienol , and 24-etylcholesterol, 24-methylcholesta-5,24-dienol, and 28-isofucosterol  have been found to be the major constituents of the 4,4-dimethyl, 4-methyl, 4-desmethyl sterol fractions, respectively. A mixture of 6′-O-palmitoyl- and 6′-O-stearoyl-β-sitosterol-3-O-glucoside has been obtained together with two glycerogalactolipids (30, 31)  ([Fig. 2]). In an investigation of the volatile constituents, megastigmatrienone, β-ionone and 3-hydroxy-β-ionone were found to be the main ketones. Hydrocarbons include β-elemene and δ-cadinene. Phenethyl alcohol and benzyl alcohol were accompanied by smaller amounts of linalool and terpinen-4-ol . The sesquiterpenes solavetivone (32) and 1,2-dehydro-α-cyperone (33) were isolated from the essential oil  ([Fig. 3]). Finally large amounts of methyl linoleate together with further esters of C16 and C18 fatty acids were detected . Recently a study on aroma-active compounds combining GC‐MS and GC-olfactometry showed that 1-octen-3-ol, 3-hydroxy-2-butanone, acetic acid, hexanal and (E)-2-heptenal were the most contributing odor components . Investigations on the underground parts have focused on L. chinense. A great variety of secondary metabolites have been isolated from the roots or the root bark. Of particular interest is a group of cyclic peptides, licyumins A–D (34–37) , ,  ([Fig. 4]). 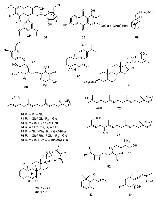 The authors also isolated in the course of their studies an indole glycoside (38) derived from tryptophan  ([Fig. 3]). Further nitrogenous compounds include aurantiamide acetate (39) , lyciumamide (40) , and a series of tyramine derivatives (41–44) , . The roots contain alkaloids, such as the spermine alkaloids kukoamines A (45)  and B (46)  ([Fig. 3]). 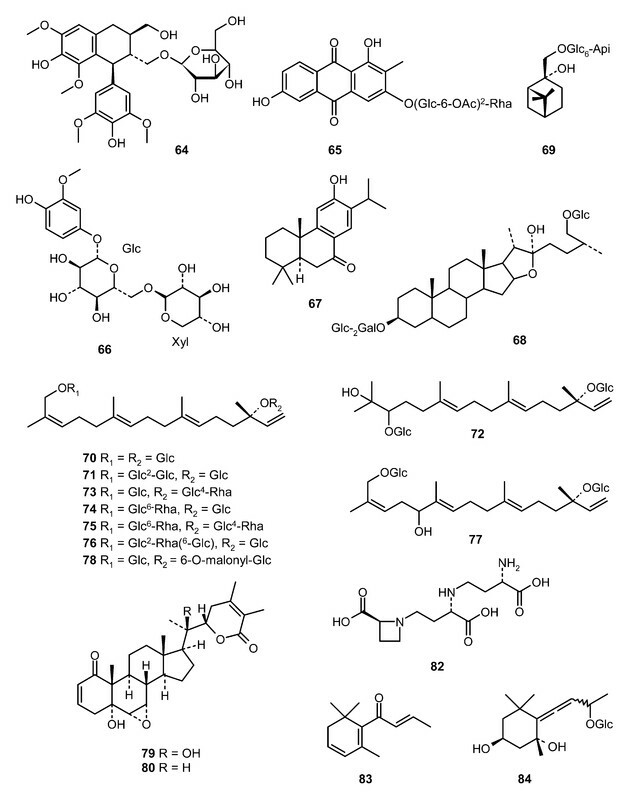 A series of calystegenines and N-metylcalystegines (47–61), among these some compounds with β-glucosidase and/or α-galactosidase inhibitory activity, as well as two polydroxylated piperidine alkaloids, fagomine (62) and 6-deoxyfagomine (63) were also purified  ([Fig. 5]). With regard to polyphenolic compounds, the roots contain the flavonoids apigenin, acacetin, luteolin, kaempferol, and quercetin , as well as the flavone glycoside linarin . 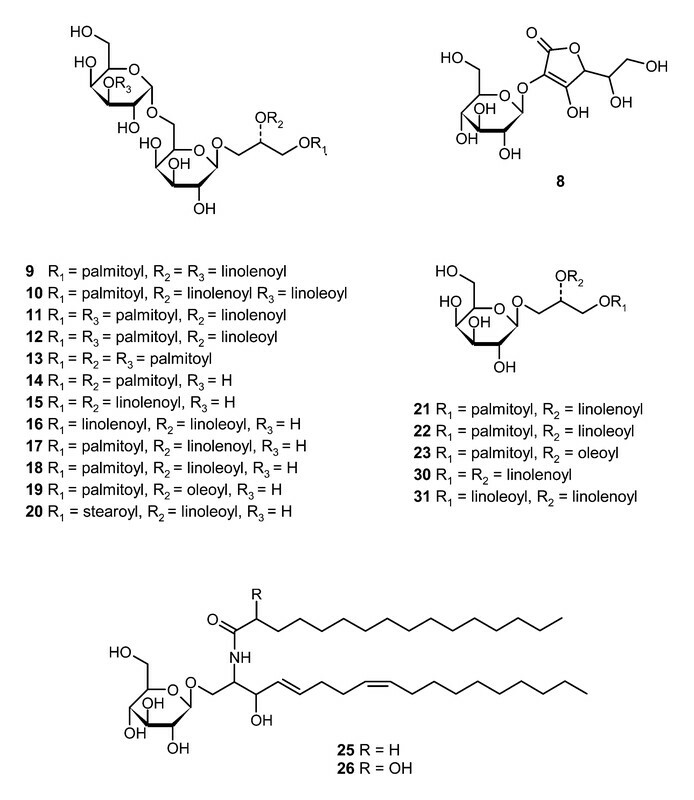 The coumarin scopoletin, and its glycosides scopolin and fabiatrin (7-O-β-xylopyranosyl-(1 → 6)-β-glucopyranosylscopoletin) have been isolated . 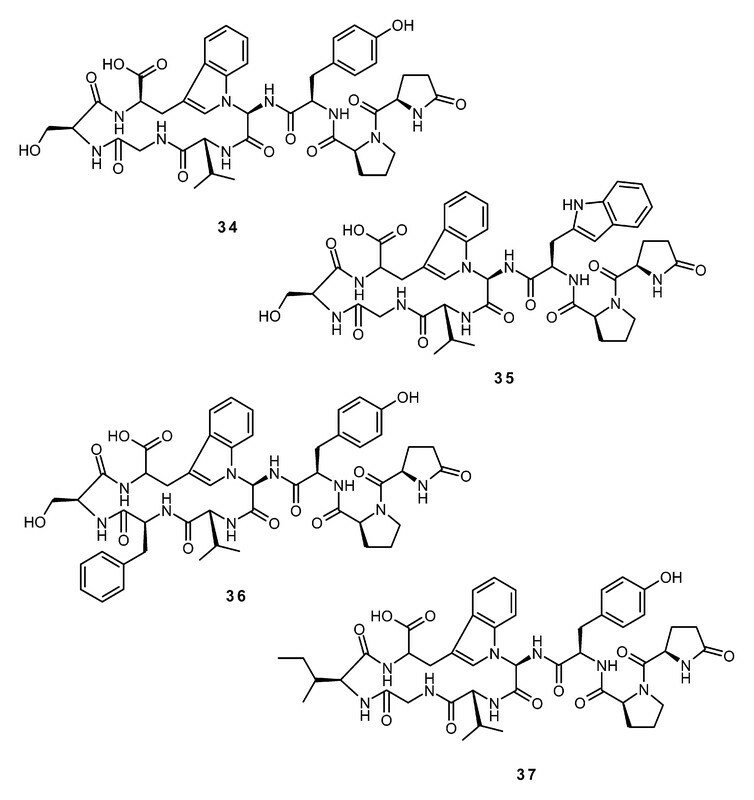 The lignan (+)-lyoniresinol-3O-β-D-glucopyranoside (64) has been obtained from the root bark ,  ([Fig. 6]). A series of anthraquinones, including physcion, emodin, 1,3,6-trihydroxy-2-methylanthraquinone, and the glycoside 65 have been reported , . Phenolic acids and glycosides, such as p-coumaric and vanillic acids, syringic acid-O-glucoside and digupigan A (66) have been reported , . Terpenoids include 5α-stigmastane-3,6-dione , the diterpene sugiol (67) , the steroidal glycoside 68 and a monoterpene glycoside (69) . The fatty acids α-dimorphecolic acid (= 9-hydroxy-E‐10,Z‐12-octadecadienoic acid) and 9-hydroxy-E‐10,Z‐12,Z‐15 octadecatrienoic acid were isolated as ACE inhibitors . Finally, the presence of vitamin C (cited in ) and betain  must be mentioned. Fig. 4 Cyclopeptides from the roots. Fig. 5 Alkaloids from the roots of L. chinense. Fig. 6 Miscellaneous compounds from the roots and the leaves. There are comparatively few investigations on L. barbarum roots. The cyclooctapeptides lyciumins A and B (34, 35) which have been isolated from L. chinense were also detected in the roots of L. barbarum by HPLC . The roots further contain betain , choline , linoleic acid and β-sitosterol . The presence of atropine in the roots was reported in the same publication in which a high concentration of this alkaloid was reported in the fruits . However, this stays in contradiction with results obtained previously which excluded the occurrence of atropine and scopolamine  in the root bark. Phytochemical investigations on leaves have focused on L. chinense, and only limited information is available on the constituents of L. barbarum. Terpenoids are certainly the most interesting constituents of the leaves of L. chinense. 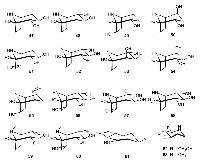 A series of acyclic diterpene glycosides, lyciumosides I–IX (70–78) , , have been isolated. Lyciumosides appear rather specific of L. chinense and have been otherwise only detected in Nicotiana attenuata  ([Fig. 6]). Two steroids of the withanolide type, withanolides A (79) and B (80) have been purified already in the 1970s . These compounds, which are typical constituents of Withania somnifera, display anti-inflammatory properties and have long been considered to be the main active principle of herba Lycii. Finally, β-sitosterol and its glucoside have been isolated . Flavonoids represent a further group of important metabolites in the leaves. The aglycones apigenin, quercetin, acacetin, luteolin, and 5,7,3′-trihydroxy-6,4′,5′trimethoxyflavone have been identified . Glycosides include rutin, quercetin-3-O-sophoroside, quercetin-7-O-glucoside-3-O-sophoroside, kaempferol-3-O-sophoroside, kaempferol-7-O-glucoside-3-O-sophoroside, and acacetin-7-O-α-L-rhamnopyranosyl-(1 → 6)-β-D-glucopyranoside , , . The carotenoids lutein (81) and β-caroten (5) have been detected. Miscellaneous phenolic compounds include scopoletin , vanillic acid  and chlorogenic  acid. Nitrogenous compounds comprise the ubiquitous metal chelator nicotianamine (82) , hypoxanthine, and the nucleosides inosine, cytidine 5′-monophosphate and uridin-5′-monophosphate . The free amino acid composition undergoes strong seasonal variation, but alanine, histidine and proline dominate . Citric acid is the major nonvolatile organic acid in the leaves followed by oxalic acid . Fructose, galactose, maltose, and sucrose were found as free sugars . The volatile constituents of the leaves have been comprehensively investigated by GC‐MS . 45 compounds were identified, including ionol (isomer not indicated, but probably β-ionol), menthol, limonene, as well as large amounts of 3-hexadecen, 2-methylbutanal and phytol. 3-Hydroxy-7,8-dehydro-β-ionone has been isolated . Finally, the content of total tannins in the leaves has been determined to be 0.90–2.10 % using the AOAC (1985) method, but structural information is not available . Little is known about the constituents of the leaves of L. barbarum. The flavonoids quercetin 3-O-rutinoside-7-O-glucoside, kaempferol 3-O-rutinoside-7-O-glucoside, rutin, nicotiflorin, isoquercitrin, quercetin, and kaempferol have been isolated . In addition, damascenone (83), and a glucosidic precursor thereof (84) , choline , scopoletin, vanillic acid, salicylic acid , and nicotinic acid  have been reported. Finally, diosgenin, β-sitosterol, and lanosterol have been isolated from the flowers . Pharmacological investigations on L. barbarum fruit were almost exclusively from China and have been usually performed with an aqueous extract or more or less purified polysaccharide fractions. In this context, it must be critically pointed out as a preliminary remark that no data are available on the pharmacokinetics of LBP and their bioavailability is not studied. Investigations have focused on antioxidative and immunomodulatory properties in the context of age-related diseases including atherosclerosis, neurodegeneration and diabetes . Antioxidant properties have been detected in various in vitro and in vivo assays. The activity has been mainly attributed to the polysaccharides (LBP) ,  and flavonoids . For both groups of compounds, the mechanisms of action involve reducing capacity, metal ion chelation and radical scavenging activity , . Betain could also contribute to the antioxidant action . Of particular interest is the activity of the polysaccharides, since these constituents are relatively characteristic of Goji fruit. Polysaccharides extracted from the fruit exhibited antioxidant activity in the β-carotene/linoleic acid assay as well as radical scavenging activity towards the superoxide anion and reducing capacity which were similar to those of the synthetic antioxidant BHT . They also strongly inhibited the AAPH [2,2′-azobis (2-amidinopropane) dihydrochloride] induced hemolysis of erythrocytes. The glycoconjugate LbGp5B inhibits LDL oxidation in vitro . LBP showed protective effects on heat induced damages in rat testes in vivo per os and H2O2-induced oxidative damage in mouse testicular cells in vitro . In rabbits fed with 1.5 % cholesterol over ten weeks, celiac injection of LBP reduced the increase of triglyceride, increased the ratio of HDL cholesterol to total cholesterol and improved oxidation markers . Oral infusion of LBP decreased the levels of LDL, triglycerides and total cholesterol, while increasing the activities of antioxidant enzymes in mice fed with high-fat diet . Oral administration of LBP exhibited protective effects on streptozotocin induced oxidative stress and DNA damages in diabetic rats , . In the same model, they markedly decreased the plasma cholesterol, fasting insulin and postprandial glucose levels. Improved insulin sensitivity was associated with increased levels of the glucose transporter 4 (GLUT4) on the surface of skeletal muscle cells . Hypoglycemic and hypolipidemic effects have also been observed in alloxan-induced diabetic/hyperlipidemic rabbits  treated by oral infusion of a fruit water decoction, as well as crude and purified LBP fractions. Immunomodulatory properties have attracted much attention, also in the perspective of cancer immunotherapy. LBPs have been shown in several studies to promote splenocyte proliferation , , ,  in vitro. T lymphocyte proliferation was reported in vitro and in mice which received LBP, LBPF4, or LBPF5 i. p. or p. o. . LBP induces dendritic cell maturation and enhances their immunogenicity. Dentritic cells activated by LBP in vitro enhance Th1 and Th2 responses both in vitro and in vivo . There are evidences that LBPs act through enhanced expression of various cytokines and transcription factors. The protein polysaccharide complex LbGp4 stimulates the expression of nuclear factor κB (NFκB) and activator protein 1 (AP-1) . LBP3 was shown to increase the expression of interleukin-2 (IL-2) and tumor necrosis factor-α (TNF-α) at the mRNA and protein levels in cultures of human peripheral blood mononuclear cells . The immunostimulatory activity appears to account for the antitumor properties which have been detected in mice. Thus, inhibition of the growth of S180 sarcoma tumors in mice treated p.o with LBP3p, a purified fraction from LBP3, was correlated with increased macrophage phagocytosis, spleen lymphocyte proliferation, CTL activity, and IL-2 mRNA expression . In addition to immunostimulatory effects, propapoptotic properties may contribute to the antitumor properties. LBP inhibits cell proliferation with cell cycle arrest in the S phase and induce apoptosis of a human hepatoma cell line in vitro . Apoptosis is stimulated by a water extract in hepatocellular carcinoma cells . Inhibition of proliferation of prostate cancer cells PC3 in vitro has also been reported. In the latter study, activity has been, however, quite strangely assigned mainly to scopoletin . Recently, an aqueous extract was shown to inhibit the growth of the estrogen receptor positive human breast cancer cell line MCF-7, and alteration of estradiol cellular metabolism has been suggested as the mechanism . Finally, hematopoietic properties should be mentioned in the context of a potential use as adjuvant in cancer therapy. In irradiation- or chemotherapy-induced myelosuppressed mice, LBP injected subcutaneously alleviated the decrease of red and white blood cells, an effect which may be due to the stimulation of PBMCs (peripheral blood mononuclear cells) to produce G‐CSF (granulocyte colony stimulating factor) production . Another line of interest has been on neuroprotective properties. It must, however, be noted that work in this field is almost solely from a single research group at the University of Hong Kong and the data are mainly in vitro. Pretreatment with an aqueous extract of L. barbarum fruits has been shown to protect rat cortical neurons against Aβ induced toxicity in vitro. The underlying mechanism appears to involve inhibition of the Aβ-triggered c-Jun N-terminal kinase (JNK) signaling pathway . L. barbarum extract also protects against reducing stress induced by dithiothreitol, which indicates that the neuroprotective activity is not merely due to antioxidative properties . The same authors also observed reduced activity of caspases 3 and 2 and inhibition of phosphorylation of double-stranded RNA-dependent protein kinase (PKR) . In one of the rare in vivo studies, neuroprotective effects have been investigated in an ocular hypertension model of glaucoma. Rats fed with an aqueous extract of L. barbarum showed a strong reduction of the retinal ganglion cell loss. The intraocular pressure was not altered by the treatment . There have been fewer investigations on L. chinense fruit. The focus of the investigations has been, as for L. barbarum, on the antioxidative properties but more specifically in the context of hepatoprotection. Free radical scavenging properties of polar extracts against the DPPH radical have been correlated with the flavonoid content . Work on hepatoprotection has been for the most part carried out at the Seoul University, South Korea. A CHCl3-MeOH extract displayed protective activity against CCl4-induced hepatotoxicity. 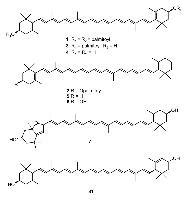 The activity of the hexane-soluble fraction of this extract was attributed to zeaxanthin (4) and zeaxanthin dipalmitate (1) . Zeaxanthin dipalmitate reduced hepatic fibrosis induced by bile duct ligation/scission in rats at a dose of 25 mg/kg per os. The antifibrotic activity appears mediated, at least in part, by the antioxidative activity . The two cerebrosides 25 and 26 were identified as active components in the EtOAc-soluble fraction after bioactivity-guided isolation . These compounds showed protective effects on rat hepatocytes exposed to CCl4  or galactosamine . Some further compounds isolated from the fruit displayed hepatoprotective activity. Thus, the three pyrrole derivatives 27–29 showed protective effects comparable to silybin on CCl4-induced toxicity in rat hepatocytes . Aqueous extracts demonstrated also protective effects in vivo against CCl4-induced liver toxicity as well as anti-inflammatory activity against carragenan induced rat paw edema . However, it must be critically noted that in this study similar potencies were observed for the different plant parts which appears somewhat peculiar in view of their rather different chemical compositions. Moreover the data do not show clear dose/response effects. More recently, the hepatoprotective effect of the aqueous extract of the fruit administered orally was confirmed in rats intoxicated with CCl4. The underlying mechanism appears to involve antioxidative properties and a decrease of the expression of CYP2E1 . Investigations of the roots have focused on L. chinense. Several publications refer to a series of pharmacological activities including hypotensive, hypoglycemic, and antipyretic activities in animal models . However the original data are for a large part not accessible and the mode of administration, as well as the exact Lycium species are unclear. Some data are available which support the use of the drug for hypertension. Thus, a methanol extract of the root has been shown to produce hypotension in rats at a dose of 0.5 g/kg i. v. The spermine alkaloid kukoamine A (45) has been identified as the hypotensive principle . The inhibitory activity of the peptides lyciumins A (34) and B (35), isolated from the root bark towards the angiotensin converting enzyme (ACE) and renin has been demonstrated in vitro . Recently, the purification of a further ACE inhibitor (structure unknown) has been reported. According to the ESI‐MS data (pseudomolecular ion at m/z 862), the compound might be a further peptide of lyciunamin-type. Unfortunately, the part of the plant from which the compound has been purified is not indicated in the publication . 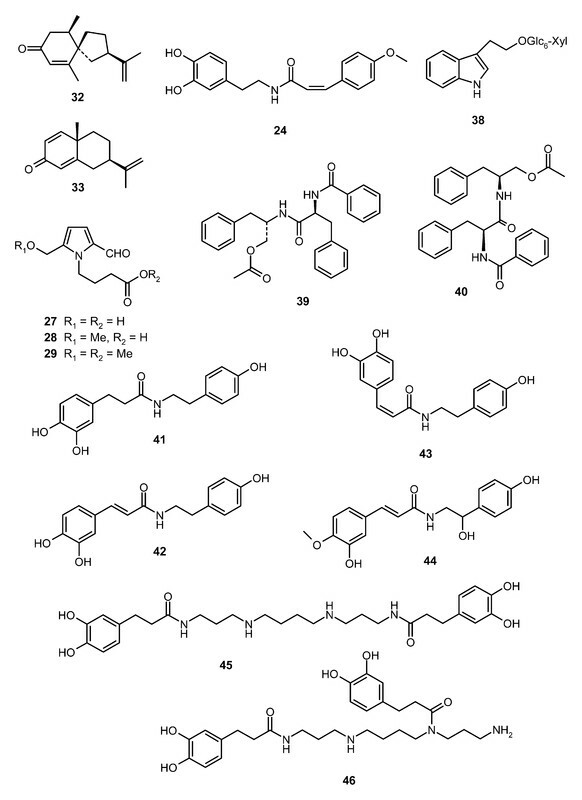 In addition to hypotensive properties, a few miscellaneous activities have been reported for the root bark: an EtOAc soluble fraction and the phenolic amides 41–44 isolated thereof exhibited antifungal properties . Three of them (41–43) were also shown to possess superoxide scavenging properties . As already mentioned, aqueous extracts demonstrated protective effects in vivo against CCl4-induced liver toxicity as well as anti-inflammatory activity against carragenan induced rat paw edema . Finally, very weak inhibition against MAO‐A (IC50 0.44 mg/mL) and B (IC50 0.4 mg/mL) has been reported for a 50 % aqueous methanol extract in the course of a general screening . Studies demonstrating the clinical efficacy of cortex Lycii against hypertension and diabetes are cited in some books on TCM drugs , . However, the original clinical data have only been published in national journals which are not accessible. While there is some more information with regard to the clinical effects of the fruit, reliable data are essentially lacking. Investigations were mainly performed in China and have focused on age-related conditions. Most studies were small-sized and not adequately controlled. Moreover, most literature is only available in abstract form since original data from Chinese publications are difficult to access. In most cases it is not clear whether L. barbarum or L. chinense has been used in these studies. In a representative study with 42 elderly participants, consumption of 50 mg of wolfberry extract twice a day over two months decreased dizziness, fatigue, chest distress, sleep problems, and anorexia  (cited in ). However, significance was not statistically assessed in the study. In another study, ingestion of 50 g/d of Goji berries in 25 elderly people for 10 days increased SOD and hemoglobin and decreased blood lipids significantly  (cited in ). Recently, in a first double-blind study performed outside China, the general effects of GoChi™, a commercial Goji juice, were investigated in young healthy adults. Various parameters were assessed by a questionnaire. Blood pressure and body weight were also monitored. The study concluded that consumption of GoChi™ for 14 days increased subjective feelings of general well-being and improved neurological performance as well as gastrointestinal function . However, the small size of the study (N = 34) and the subjective assessment of most parameters must be critically pointed out. In a follow-up double-blind study (N = 30) sponsored by FreeLife International Company, the authors investigated the effect of GoChi™ on serum antioxidant markers in healthy Chinese adults aged 55–72 years. A significant increase of SOD and GSH‐Px by 8.4 and 9.9 % respectively and a concomitant decrease of MDA (malondialdehyde) by 8.7 % were observed after 30 days . These data are in agreement with previous observations  and may be indicative of possible beneficial effects in oxidative stress and age-related conditions. In one of the most noted clinical studies on Goji, its effect as adjuvant in cancer therapy has been investigated. The study was conducted in China on 75 patients with various advanced cancers. Combination of IL-2/lymphokine-activated killer (LAK) therapy and L. barbarum polysaccharides afforded significantly higher response rates and longer remission rates than IL-2/LAK therapy alone . Unfortunately, insufficient information is provided about the design of the study and the wolfberry supplements included in the diet to fully appraise the relevance of the data. Clinical effects of Goji berries are generally attributed, at least for a large part, to LBP. However, data on bioavailability and pharmacokinetic behavior are still essentially lacking. In this context it should be noted that besides direct effects of LBP on pharmacological targets, indirect mechanisms have been suggested by which LBP could act in the gut as bioactive fibers or prebiotics , . Finally, carotenoids from wolfberry have been investigated in the context of age-related eye diseases. While there are no data demonstrating the effect of the intake of Goji itself, there are many lines of evidence supporting the protective role of zeaxanthin. Thus, reduced incidence of cataract and macular degeneration has been linked to the consumption of leafy green vegetables, which constitute a rich source of zeaxanthin and lutein , , . A study with twelve volunteers who received free or esterified carotenoids extracted from Goji (L. barbarum) berries suspended in a yoghurt, confirmed the bioavailability of zeaxanthin. Moreover, the study indicated a strongly enhanced absorption of zeaxanthin diplamitate, the dominating carotenoid in Goji fruit, compared with the non-esterified form . Trace amounts of atropine detected in the fruit are of no toxicological relevance. In this context, the classification of Lycium barbarum in some books ,  as a toxic plant is certainly unfounded. In a book on Chinese materia medica, the LD50 of a water extract of Goji berries is reported as 8.32 g/kg by subcutaneous application in mice , which confirms the virtual absence of toxicity of the fruit. However, while there is no risk with cultivated plants, some caution is advised with samples of unknown origin, since confusion with morphologically similar Solanaceae fruits can not be excluded. Misidentification may be in fact at the origin of some contradictory data regarding the alkaloid content of Goji berries. The root bark shows very low toxicity as well. Some data on acute toxicity have been reported in medicinal books but doses are unrealistically high and no references to the original studies are given. Thus, the LD50 of the decoction by intraperitoneal injection is reported to be 12.8 g/kg in mice and 30 g/kg in dogs. The LD50 by oral administration in dogs is 120 g/kg , . Vomiting appears in dogs receiving 120 g/kg orally or 30 g/kg intraperitoneally. In rabbits drowsiness was observed at doses of 80 g/kg (orally) or 60 g/kg (i. p.) . In addition to these data of ill-defined origin, an increase in the weight of heart, liver and lungs was observed in the course of the assessment of subacute toxicity in rats with high doses (5 and 10 g/kg) orally over a test period of 14 days. A rise of blood urea nitrogen (BUN) and a decrease of creatinin were also noted as well as a raised count of white blood cells. However, there was no sign of any irreversible pathological damage or mortality in the rats. No modification of the locomotor activity, food consumption and water intake was observed . In spite of the very long history of traditional use as food and herbal medicine, there are practically no reports of adverse effects due to Goji fruits. Only a few cases of allergic reactions including urticaria-like or papular rashes have been documented . In Chinese medicinal books some caution is advised to pregnant women. Also it is recommended that patients suffering from diarrhea, fever, arthritis and strong inflammatory conditions should avoid the consumption of the fruit , , . However, no rationale is given as to substantiate these recommendations. As to the root bark, adverse effects such as vertigo, palpitations, nausea, vomiting, and premature contractions have been reported, but only at high doses (50 g), exceeding by far the normal dosage range of 5–15 g . Nevertheless, as for cooling agents (cold Yin agents) in general, the traditional Chinese medicine advises people suffering from Yang deficiency and/or weak stomach or spleen to consume the drug very sparingly . The root is also contraindicated for patients with “exterior wind-cold” or “wind-heat conditions” and people who have “true cold but false heat” should use it with caution . While the root bark and the fruit appear devoid of any acute toxicity, there are hints to potential drug interactions, as shown by two case reports documenting a possible interaction with warfarin. A 61-year-old Chinese woman stabilized on warfarin developed elevated international normalized ratio (INR) after drinking a tea of Goji berries over four days. The value returned to normal after discontinuing the tea . Weak inhibition of CYP2C9 was detected in vitro. However, the very high dissociation constant (Ki of 3.4 mg/mL) suggests that other mechanisms account for the drug interaction in vivo. In a further case which has been very recently reported, a 80-year-old Chinese woman on a chronic stable dose of warfarin experienced two episodes of an elevated INR after drinking an herbal tea containing L. barbarum . Unfortunately, the report does not specify whether fruits or roots were taken and does not include data on the composition of the tea. The risk of drug interactions associated with Goji can not be definitively assessed, but caution is advised in particular for patients on medication with drugs with a narrow therapeutic index. Goji is commonly designated as “Himalayan Goji berry“ or ”Tibetan Goji berry” on the global functional food market. The variety of commercialized products is considerable: besides juices, beers and wines, Goji is found in cookies, crispy bars, chocolate, muesli, sausages and soaps. Goji products have been marketed via Internet since 2002 and are also increasingly available in drugstores, “Reformhäuser”, or organic food shops. Goji products are quite expensive with 30–50 dollars to be paid in average for a 1 L bottle on the Internet market. The recent commercial success of Goji in Western countries has been strongly pushed by a booklet of Dr. Earl Mindell published in 2003, entitled “Goji, The Himalayan Health Secret” . Dr. Mindell is a controversial Canadian-American pharmacist and nutritionist who has written a series of books on food supplements and nutrition for the public. His theories on health and nutrition have met with deep scepticism in the scientific community. In the above-mentioned book, he extrapolates broad recommendations of uses for Goji juice, including cancer prevention, cardiovascular health, treatment of diabetes and obesity, from traditional practices and preliminary studies performed almost exclusively in China. In particular, he claims quasi-miraculous effects on life expectancy for Goji identified as “the Himalayan longevity fruit”. Dr. Mindell and his statements about the “extraordinary value” of Goji are abundantly cited in advertisements for Goji products, in particular by his partner company FreeLife International which distributes Goji juice via multilevel marketing. The health benefits claimed by Dr. Mindell and to be found in the web publications of the Goji manufacturers have been individually and critically reviewed in a recent book on wolfberry . The authors conclude that there are no scientific evidences and peer-reviewed proofs to validate any of the claims until now. One of the newest products is GoChi™, a juice claimed to contain over 30 % more bioactive polysaccharides, which has been launched by FreeLife International in 2008. The name GoChi is a combination of go from Goji and the Chinese word chi meaning life energy. The advertising for this product draws on a recent clinical study supposed to have demonstrated the general effects of the product on health . However, considering the highly subjective parameters, the small number of participants and the relatively short-term study, the relevance of this study is highly questionable. Goji berries and Goji products are legally sold as food or food supplements in the USA and in Europe. However, these products cannot be promoted as drugs, and therapeutic claims are prohibited. In 2006 the FDA had to send warning letters to some Goji juice distributors about marketing claims which violated the Food Drug and Cosmetic Act , . In Europe, an evaluation procedure has been started by the UK Food Standards Agency in 2007 to establish whether Goji berries should receive the status of Novel Food, like Noni juice (Morinda citrifolia) in 2003 , . After reviewing the data, the agency came to the conclusion that there were sufficient records of alimentary use of Goji in the UK before 1997 and that the fruit consequently does not fall under the Novel Food legislation . As to the situation in the United States, Goji is not listed on the GRAS (generally regarded as safe) list of the FDA. Goji has a long tradition of use in nutrition and medicine in East Asia. While the clinical efficacy is not yet established, various extracts, fractions and purified constituents were shown to exhibit interesting pharmacological properties in vitro and in vivo suggesting that they may be beneficial for the prevention and the treatment of age-related disorders. However, some of the activities were detected at very high concentrations only, and these studies should be considered with caution. Further investigations and in particular well-designed clinical trials with phytochemically well-characterized extracts are required before the potential of Goji as a medicinal plant can be definitively assessed. Concerning the numerous products found on the health food market, there are at the moment no scientific evidences to sustain the claims made for Goji juice as a “cure-all” or a miraculous drink for well-being and longevity. The fruit is devoid of toxicity, but caution is advised with regard to possible drug interactions as well as with products of unknown or dubious origin. The development of rigorous quality control procedures for Goji products is urgently needed. Mrs. Loredana Vasquez Briceno is gratefully acknowledged for bibliographic research. 149 European Commission .Commission decision of 5 June 2003 authorising the placing on the market of „noni juice“ (juice of the fruit of Morinda citrifolia L.) as a novel food ingredient under Regulation (EC) Nr. 258/97 of the European Parliament and of the Council. Official Journal of the European Union 2003: L 144/12, 12.6.2003.